Stress fractures can put full out stop on running, which is a problem if you like to run a lot. It also makes training for a one hundred mile race very challenging. The anti-gravity treadmill is the solution to this dilemma. An anti-gravity treadmill lifts a portion of your body weight off your feet. How does it do this? You wear a pair of skintight neoprene shorts, which zip into an inner tube. It’s a little like being in a swimming pool. The “inner tube” fills with air and calibrates your weight. Once it’s done you choose how much of your body weight to take off your feet in percentages. The technology was developed for the use on space shuttles. The anti-gravity treadmill allows you to continue to actually run, unlike the elliptical or other machines you find at the gym. It also maintains better running form than you can in a swimming pool and continues to condition your body to the impact of running although at a lesser degree. 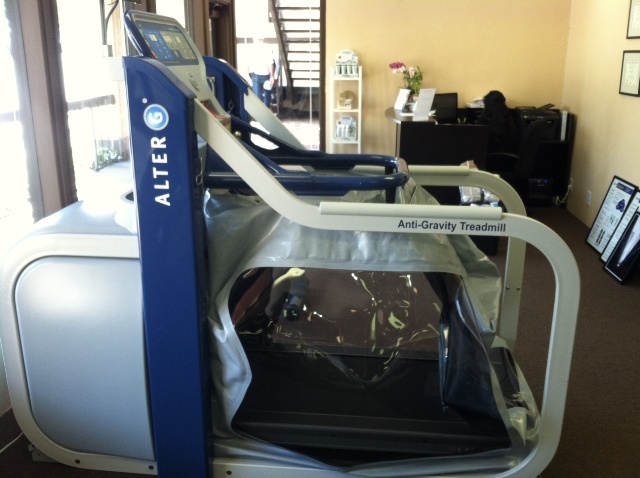 The anti-gravity treadmill allows you to maintain your aerobic fitness. Not only has the anti-gravity treadmill made it possible for injured runners to maintain fitness, but many elite athletes are using the anti-gravity treadmills in their weekly training. It allows them to increase their miles while reducing the impact on their muscles, joints, and tendons. The treadmill is also being used to encourage overweight individuals to start running. It reduces the impact on their bodies as they begin a training program. It also gives them an idea of what it feels like to run without all the extra weight. Anti-gravity treadmills range in cost from $75,000 to 25,000 depending on the model you choose. This, of course, limits those who have access to them, let alone own one. It’s much like a typical car loan with payment of about $550 a month for five years. The downside, other than the cost, is it’s a treadmill. If you run outdoors all the time or in the mountains, running on a treadmill is a huge challenge. It’s boring, although slightly less boring than running in the swimming pool. Audiobooks, story apps, and/or music are essential (at least for me), on any treadmill and this one is no different. I do have to say, after not being able to run at all for four weeks, the anti-gravity treadmill is a little piece of heaven.